The best music genre or band documentaries (think Metal: A Headbanger’s Journey or Some Kind Of Monster) work two angles: they appeal to the fans by packing the films with the best bands and music; and they’re informative, so someone who wants to learn about the genre or band can do so, and even die hard fans might learn a thing or two. 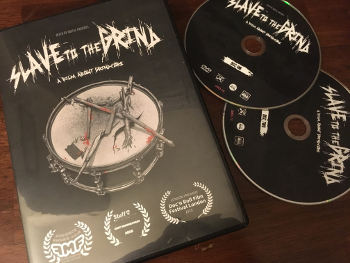 Slave To The Grind: A Film About Grindcore by Doug Brown won’t win any awards for narrative or flow, but it checks a lot of boxes: Repulsion, Napalm Death, Siege, Terrorizer, Earache, Brutal Truth, Discordance Axis, A.C., and the list goes on. The bonus disc has video of a Q&A with Repulsion and Terrorizer L.A. (and deleted scenes and other extras). There’s even a quick demonstration of a blast beat. Brown has been putting the time and effort into promoting his film, getting it screened at various death metal festivals internationally and touring it (which included a Washington D.C. show and screening last year). Slave To The Grind succeeds better at the former angle of getting thumbs-ups from fans than at educating, but it’ll hold your attention and it’s entertaining. Those are two good checked boxes right there. Pick it up at grindcorefilm.com. This entry was posted in Reviews and tagged documentary, grindcore, slave to the grind by Editor. Bookmark the permalink.